Baby boy is growing, growing, growing! I have to say, I’m enjoying this part of pregnancy more than any other part so far. By far. Yes, I sort of feel like a whale and I’m starting to lose the energy I had in the second trimester, but I finally feel pregnant in a good way. I feel like I went the longest time without looking noticeably pregnant in my belly (only expanding everywhere else!) and then once my belly showed up around 26 weeks or so, I felt awful with those side pains/contractions. Now I am feeling good, have the belly to show for it (and then some – I think I’ve gained the absolute max of what I should or more, but it’s ok) and I can finally feel him move all the time which I cannot explain how much I love. It’s also so exciting to be nearing the end because it all seems so real—finally. 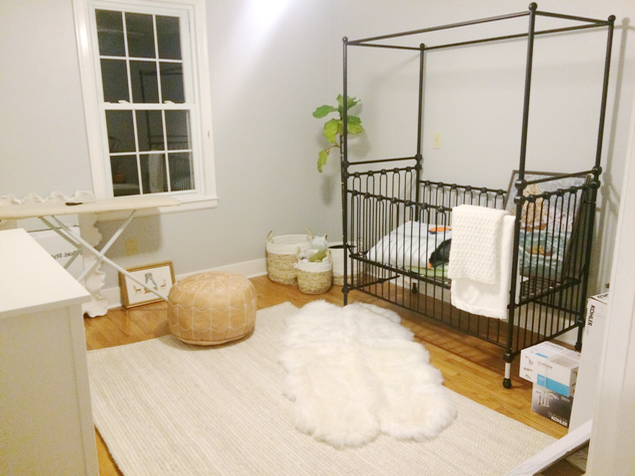 Now if we could only get that nursery completed! We went to a breastfeeding class last week and did a maternity tour this past Wednesday. Of course, I pretty much knew where everything was since I spent two evenings at the hospital in Labor & Delivery at 27 weeks. We have a newborn class coming up next week and I’m really excited about that one. Here are some things we’ve gotten for him and for the nursery. Y’all have seen the following two photos a few times already, but I don’t think I’ve put them in a pregnancy update post. The two rugs below are from Rugs USA. They are so beautiful and well made. 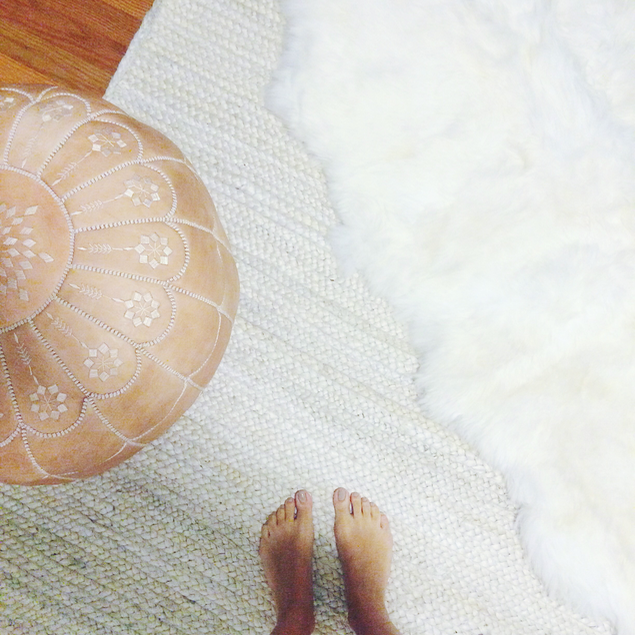 I always tend to order my rugs through Rugs USA because the prices are so good and they ship free. The jute rug on the bottom always seems to sell out quickly, but keep an eye on it because I know they get shipments in quite a bit. The sheepskin rug is so incredibly plush. I am in love with it. Here they are just thrown in the room that was going to be his nursery, and then wasn’t. 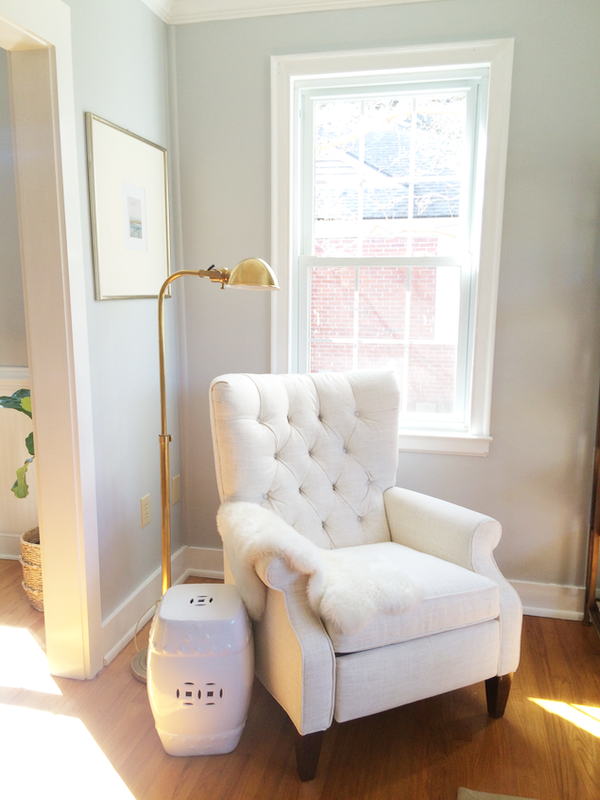 The next thing is this gorgeous Robert Abbey Alvin Adjustable Pharmacy Floor Lamp from Lamps Plus. I have it shown in our front living room now, but it’s going to go next to his glider in the nursery once we get it set up. This lamp is beyond gorgeous. It’s heavy and brass—a real showstopper. I stay pretty loyal to the companies I like. Remember I used Lamps Plus for our bedroom lamps? And what do you know… they were Robert Abbey, too! Just really well made products that are made to order in Hickory, NC. So this is the coolest thing possibly ever. 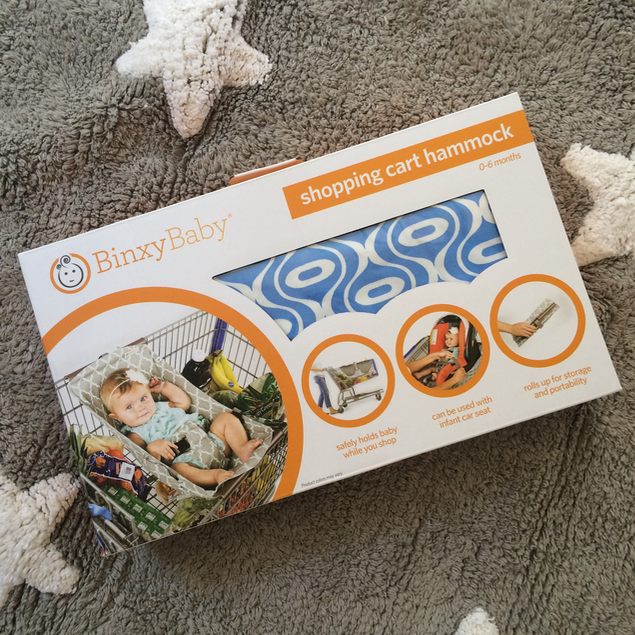 Have you heard of BinxyBaby? This company was created by a busy mom of three who realized there was just not enough room in her grocery shopping cart when toting all those babes around. So she made this shopping cart hammock. It’s pretty genius—just strap it from one side of the cart to the other and you can either put your baby in it or strap the infant car seat in it. I love this blue design because it’s perfect for a boy or a girl, but there are three other colors available. This would be an awesome shower gift! And this rug. I was just introduced to Lorena Canals and I’m so glad that I was because I foresee a long friendship with this children’s rugs company. Lorena, the founder and designer, has been in the business for 25 years, but decided to start specializing in rugs about 12 years ago when she realized her own children’s rugs at home weren’t washable and that wasn’t very kid-friendly. This company chooses the best raw materials, only uses natural dyes (which is great since babies crawl all over rugs), and makes sure that no child labor is used in the production process. There are so many cute designs. Like, seriously cute. 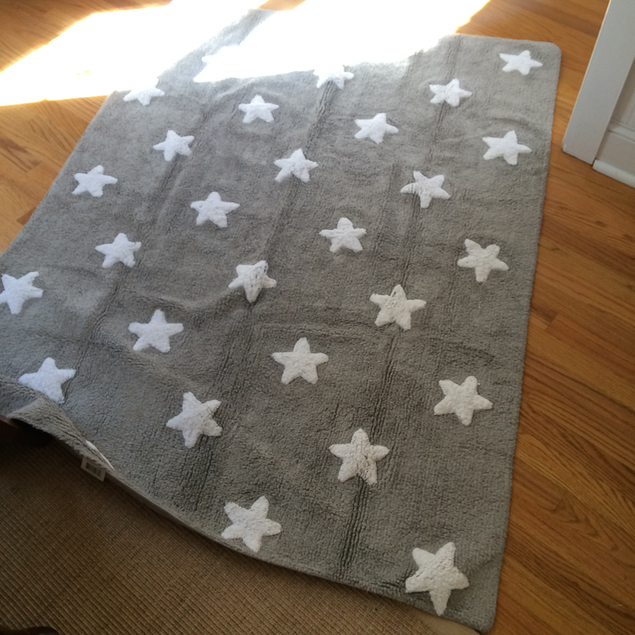 We decided on the stars rug. I’m not really a stars person to be honest—would have thought polka dots would be the one we were drawn to, but the stars are ADORABLE. Oh, the big thing! All of her rugs are washable! Just throw them into the machine. They are so soft and well made with heavyweight fibers. I’m really excited about this rug, can you tell? This is it just pulled out of the packaging – the folds have settled out now! Next Post 5 current favorites + announcement! Love the update! It's also reassuring to hear that your bump didn't pop until 26 weeks! I'm about to hit 19 on Sunday and I'm ready to look pregnant! I just look like I went up a pant size at this point. All of your updates look great! That star rug is just precious! Hi Meagan! I was wondering where your chair is from? Thanks! I know you've mentioned it before but I can't find it? Where did you get your leather pouf from? I loooove it! Hi Christine! I got it from Joss & Main. It's currently on their site and you get an extra 15% off right now + free shipping! Here's the link! You know what – I think that pouf is not exactly like mine. This is the exact one I have! Other health problems can make your pregnancy a high-risk. These include heart valve problems, sickle cell disease, asthma, lupus, and rheumatoid arthritis. Talk to your doctor before if you have any health problems before conceiving.